1987’s Wall Street is one of the defining movies of its decade. This year’s sequel… not so much. As Money Never Sleeps begins, Gordon Gekko (Michael Douglas) has finished serving a long prison sentence for the crimes he committed in the previous film. He’s released just in time to write a book warning of the 2008 financial crisis which would make his corporate raider exploits look positively quaint by comparison. But the truth is, this movie is far more concerned with soapy melodrama than director Oliver Stone’s trademark political vitriol. 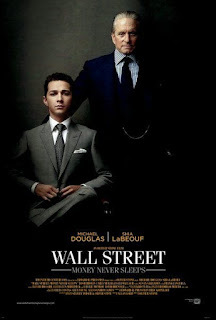 Rather than follow the money, the movie follows the romance between up and coming trader Jacob (Shia Lebouf) and Gekko’s daughter Winnie (Carrie Mulligan). Their relationship becomes complicated when Jacob falls under Gordon’s spell. Winnie wants nothing to do wither her dad, but Jacob offers to help father and daughter reconnect in exchange for a little help dealing with Bretton James (Josh Brolin), a corporate scumbag who is at least somewhat responsible for the suicide of Jacob’s mentor (Frank Langella). I won’t give away the ending, but let me just say that it’s pure cornball schmaltz. It all adds up to something like a big budget extended episode of Dallas. Still, I’d be lying if I said I wasn’t entertained. Call it 2 ½ out of 4 stars. Josh Brolin seems to delight in these kinds of parts, doesn't he? I notice he rarely takes credit for his odd cameo as a "Mama, is that the one?" kind of thug in Milwaukee, Minnesota, which was an interesting indie, for sure. I'll check this one out at some point -- my folks liked it.